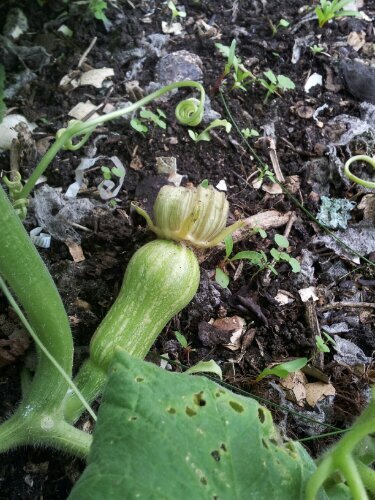 Somewhat to my surprise, my volunteer squash has actually produced a couple of baby squashes. (It turns out that it’s a butternut squash. Hurrah!) But as we head conclusively into autumn, there isn’t enough warm weather left for them to grow to a decent size, let alone to ripen. I’m not sure if it’ll work, but it was free and took only 15 or 20 minutes to set up and tie together. It’s not a good long-term cloche, either, as it’s hard to get in under it, but it’ll do for the next couple of weeks to see what happens. My main problem at this point is preventing Leon from pulling it down in order to pop all the bubbles. I’m currently planning planting for two shady areas: our front balcony and our front porch. Both of them are north-facing, so I’ve been researching north-facing and shade-tolerant edibles which will grow in containers. Most edible plants do prefer full sun; but if you’ve got shade, all is not lost. Not all shade is created equal. Some people distinguish between open, medium, and deep shade. By that reckoning, I have open shade on the balcony (which is north-facing but very open and with little shade from the front) and medium shade in the porch (north-facing and covered). Another potential distinction is between partial and full shade. I have partial shade on the balcony and full shade in the porch. Honeyberries look very interesting, are perennial (I like perennials), and apparently prefer partial shade. However, you need 2 plants for pollination. They can be grown in a half-barrel size pot, which is probably no good for my purposes as I’m not sure I want two of those on my balcony. Kiwi vines are moderately famous for being a climber that will do well in partial shade. Again, you need both a male and a female plant, and something for them to grow along. The Oregon Thornless blackberry will apparently also do well in partial shade, although again it needs a trellis to grow up and to be carefully trained. It flowers on one-year-old wood. In theory I accept that blackberries, as woodland plants, should cope well with partial shade but I confess I’m not convinced about how well they’d actually fruit. Your pot needs to be 2′ x 2′ x 2.5′ for this. Mint is one of the easiest things to grow in shade. I grew mint in a pot on the windowsill of a full-shade area outside our basement flat about a decade ago, and it did just fine. Mint is best grown in a pot even if you have ground available, as it is famously invasive. New Zealand spinach is a shade-tolerant edible perennial, but needs to be blanched before cooking. Apparently it’s best started from transplant, so if anyone who’s reading has one and might be up for sharing a cutting, please let me know. Though to be honest anything that’s complicated to cook is unlikely to find much use in this household, so it may not be worth it anyway. Apparently, swiss chard, peas, beets, and various leafy greens and salad greens are all shade tolerant too. This does fit with my experience of chard and leafy/salad greens as happy to grow through winter, when they don’t get much direct sun. It occurs to me too that planting in partial shade may inhibit bolting, meaning that we might actually have some salad greens to eat in midsummer. Similarly, I’ve had trouble in recent years with peas suffering in the unusually warm spring weather, so partial shade might help them. These can all be grown in pots, though watch this space for a roundup of which plants need deeper and less deep containers. The only problem for me with growing greens on the balcony is that they’re less harvestable for the kitchen, so cooking greens may not get so much use. Salad greens which can be nibbled while out there might be better. Finally, in the fruit line, Alpine strawberries are shade-tolerant, perennial, and very tasty, and rhubarb is shade-tolerant (indeed, it dislikes full sun) and can be grown in a (large) pot. I have some down the shady end of my garden which I’m hoping will get themselves properly established this year. Pansies are tolerant of shade, are perennial, and are one of my favourite flowers (I already have some on the balcony, in fact), but aren’t edible. Violets, on the other hand, are edible, perennial, shade-tolerant, and also lovely. Other woodland flowers are also worth considering as they tend to be shade-tolerant. Another option is plumbago: shade-tolerant, perennial, not edible, but butterflies love it. I think nasturtiums should do reasonably well in partial shade, although probably not in full shade. I found a list of other shade-tolerant edibles, which all seem likely to be a bit big for my purposes but might be useful for someone else, especially if you’re not limited to containers. There’s also a more general round-up of shade-tolerant gardening (not edible focused) at The Savvy Gardener. I’m very open to more suggestions if anyone has some, in particular for edibles although I’ll consider some pretty non-edible perennials as well. Next steps: researching which plants need what depth of container (and in particular what will tolerate shallow containers), gathering my containers together, and constructing a planting plan for the spring. The next stage in the balcony planning is a little research on plants that will do well in north-facing areas. Given my other requirements, I’m most interested in edibles, and perennials or self-seekers (for minimal ongoing maintenance). It’s a good idea to remember the difference between different types of shade: ‘open’, ‘medium’, and ‘deep’ shade. I have open shade (north-facing, but nothing much overshadowing it) which makes life a little easier. Oregon Thornless blackberry: can be grown in a pot (2′ square x 2.5′ deep, ideally) and carefully trained up a trellis. It would need regular maintenance not to overrun next door’s balcony. But I do like blackberries, and in a pot it would be less of a menace than they are in the ground. It flowers on one-year-old wood. Kiwi vines: will fruit in the shade, and could grow along the railing. I’d need a male and female plant, so one at each end. However, they would block the view through the railings onto the river, which is really valuable to me. Honeyberry: prefers partial shade, so in that sense ideal. However, you need two plants (male and female), and they grow to 5′ so need a half barrel sized pot per plant. I think it’s either this or the blackberry. Plumbago: perennial, butterflies love it, but not edible. Violet: edible, perennial, one of my favourites anyway. Mint: that old favourite for shady areas. I don’t actually use it much in cooking, but mint tea is nice, and mint, apple juice, vodka and ice is a lovely summer cocktail. Smells great on the balcony, too. I have a plant in the garden so would be easy to propagate. New Zealand spinach: a new one on me. Perennial, best started from transplant, and needs blanching before cooking so realistically probably wouldn’t get used. Chard, beets, other leafy greens: if they’re on the balcony, they won’t be readily harvestable for the kitchen, so we’re unlikely to use them. Peas: in theory the above would also apply, except that raw peas fresh from the pod taste fantastic, so could be eaten on the spot. Salad greens: could be eaten on the spot, so might be worth it, especially as the baby gets bigger and might be in and out of there more. Planting in partial north-facing shade might give some resistance to bolting and mean we get a midsummer crop, which is not possible in the south-facing and very warm back garden. I have plenty of salad green seeds so may try this out. Alpine strawberries: very very tasty. Definitely try these next year. Rhubarb: shade-tolerant, can be grown in a pot, but we already have it in the garden and it is quite large. I did also find a list of some other shade-tolerant edibles, but they all seem a bit big for my purposes. Tip o’ the hat to: the Savvy Gardener on gardening in the shade, and Life on the Balcony on shade-tolerant fruit. I’m keen to have a fruit tree in our garden, and my mind turned to what’s really the default UK fruit tree: the apple. The thing with apple trees, though (and in fact many fruit trees), is that if you want to get actual fruit, the tree needs to be fertilised. For the vast majority of apple varieties, that means having at least one other apple tree, of the right pollen group and which blossoms at the right time, planted somewhere fairly nearby. In an orchard, a big garden, or even in an allotment where you can count on other allotmenters also having apple trees, that’s fine. If, on the other hand, you have a tiny garden like mine, one tree is going to be pretty much all you can fit in. Happily, in this modern age, you can get self-fertile apple trees; that is, trees which will pollinate themselves. Even so, they’ll do better (crop more heavily) if pollinated by another nearby tree, but you’ll get a crop anyway. For my purposes, all I want is a few eating apples, and a tree to sit under, so that’ll work fine for me. The classic Cox, self-fertile version (also available from Trees Online). Upsides: well, it’s a Cox! It’s the classic English dessert apple. However, it’s also a bit tough to grow, and can be disease-prone. It needs a ‘relatively cool maritime climate’, which is fine in the UK, but I confess that the disease-prone-ness puts me off a bit. I want a tree I don’t have to struggle with. Ripens October-ish. Red Windsor (also available from the Orange Pippin shop). Advantages: easy to grow, reliable, disease-resistant, heavy cropping, apples picked over several weeks (ideal for a tree for home-eating, as it means you don’t get a glut). It has a Cox’s ancestry, but is a red variety. What I haven’t found much information about is what it actually tastes like, which puts me off a little. (The Orange Pippin folk are sadly unhelpful.) Ripens early September. Sunset. Another Cox-like apple, disease-resistant and crops well, but the flavour can apparently be variable, and less flavoursome than Cox’s in a bad year. I’m in this for flavourful apples, so not a variety for me. Ripens mid-September. Winston (also available from Victorian Nursery). Some people seem to claim that this is a russet, but its parents are Cox’s and Worcester Pearmain, so… not really. Keeps well, disease-resistant, easy to grow, and has a Cox-like flavour. Ripens in December, but sweeter if picked in January. For me, I think it’s a toss-up between Red Windsor and Winston, with a probable bias towards Winston. I shall consult the rest of the household. A quick note as well on rootstocks. M27 will give you a very small tree (up to 2m), but unless you’re seriously space-limited or growing in a pot, you’re probably better going for M9 (full height up to 2.5m), which is a little bigger and significantly more productive. Both M9 and M27 require permanent staking. If you have the space, M26 is bigger still, and MM106 a decent standard size, growing to 2.5-4.5m. For my 40m2 garden, I’ll be choosing M9 as a good compromise between size and productivity. * I have noticed some disagreement between different lists on whether or not particular apples are self-fertile. I recommend cross-checking a couple of sources before buying. I’m feeling a little unfocussed about a lot of things right at the moment. For the food-growing, at least, one solution to this is to make a list of what I need to do before the end of November. broad beans, meteor pea, early dwarf pea. Probably one lot of each this week, and another lot in a fortnight. more kale and mustard greens; the germination rate for the last lot was a little low. In fact I may start these off inside, then move to the balcony, then plant out in the cold frame on the allotment. dig up the rest of the damn potatoes. finish cutting back the blackberry. cut back the autumn rasps, once they’re actually finished (still going at the moment!). check for any seed that can be saved. build the cold frame for the mustard greens and kale. I want to at least start this this weekend. get more planks down for the raised beds. finish deconstructing the pallets so they’re out of the way. dig over the compost heap, incorporating some of the blackberry cuttings. amalgamate the extra compost heap (mostly consisting of blackberry cuttings…) into one location. go out to collect leaves from the park for mulching down (needs to happen soon; easiest way to do this would be to use one of my old compost bags & take it round the park when I go round with the dog!). keep reading the Permaculture Book and actually take some notes.
? another batch of salad veg? Don’t have any more room in the cold frame though! keep eating the salad leaves. sort out all the old pots and work out where they should go. work out where to put the salad veg cold frame that isn’t “on top of the wormery”. take up the dead peas. the best thing I could do this month, I think, is establish a routine of checking up on the balcony daily. decide what to do about the wormery – the answer probably is “dig some worms out of the allotment compost heap and relocate them”. Ha, turns out that that’s quite a lot of things to be going on with. Last week I finished my small cold frame for the balcony. The jigsaw went through the polycarb with no bother at all, and I taped the edges up with gaffer tape. To get some air into the frame, I’m using part of one of the planks I cut up for the slanted top: the polycarb lid just rests on it at the back. I haven’t bothered to make hinges; I’ll rethink that if the lid doesn’t stay put. Next plans: slightly bigger cold-frame for the table of herbs outside on the balcony, and much bigger one for the allotment. 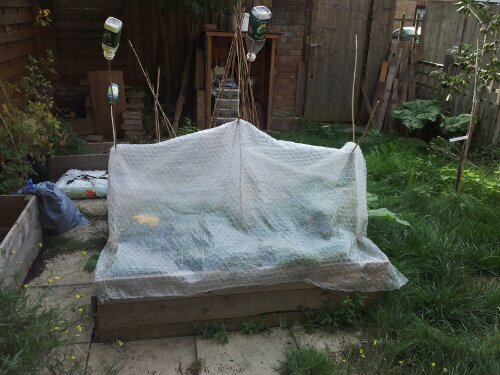 Currently in the allotment there are three rows of various sorts of greens under mini-cloches (cut the top off a one-litre juice bottle), so the cold frame needs to be built before they outgrow the cloches. In my ongoing quest to reduce food miles by growing more greenery I have spent an hour or so building a small cold frame for the balcony. It’s not quite finished yet (I have a huge piece of clear polycarbonate that I need to saw into pieces so I can use part of it for the cold frame top), but the frame itself now exists. The best bit is that it’s made from 100% reclaimed bits. The base is a wine box that I got from my parents (sadly by the time it reached me it was empty of wine). The part of the top that gives it a slope (so it’ll catch the sun better) is made from planks reclaimed from a pallet. The pallet was part of a very small pile of wood left after Climate Camp, part of which I took home*. I saved the nails as I took them out when dismantling the pallet, and enough of them were straightish that I could use them for this project. The measuring, sawing to size (including sawing the diagonals), and nailing together took under an hour: much quicker than I’d expected. I was going to use a couple of pieces of dowel to hold the two sections together, but it seems pretty stable without. An old compost bag is providing a lining. The picture shows it on the balcony in its temporary “on top of the wormery” location. (I need to rearrange the balcony space a bit.) The pots have rocket and bronze arrowhead lettuce seeds in: the hope is that the cold frame will keep the plants going over the winter & I’ll be able to keep having salads. We shall see! Part 2: cutting the top and finishing the cold frame. * Technically doop took them home, as he was the one towing the bike trailer all the way down Blackheath Hill with 30kg or so of wood on it.